From its inception, St. Mary Mother of God parish has ministered to those who live within the shadow of its steeple, and that faith in action continues to this day. On November 29, 1848, thirty German-speaking families marched in formal procession from St. Augustine’s Church (the present Cathedral of the Immaculate Conception) to the new Mother of God Church. Among them were five families who mortgaged their farms to raise the $1,700 needed to purchase land for the new church. This faith-filled gesture insured that families in the surrounding immigrant neighborhood could continue the German Catholic traditions they had brought with them from the Old Country. The first building measured 32 by 64 feet. A larger church, built in 1858, was destroyed by fire when the boiler exploded, killing the church janitor and a young girl who was walking along the sidewalk. The present building, dedicated on May 2, 1999, replaced the 1886 Gothic-style landmark church that was struck by lightning and burned on September 2, 1993. The current church complex houses worship space, classrooms and program space, parish offices, and a state of the art Soup Kitchen that has been part of parish outreach since January 22, 1975, serving the hungry in Fort Wayne nonstop ever since. 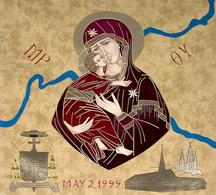 The exquisite tapestry that hangs in the east vestibule of St. Mary Mother of God Catholic Church is patterned after a traditional image often called the “Tenderness Icon”. Its formal name is “Our Lady of Vladimir”, and the tapestry depicts Mary holding the child Jesus with their cheeks touching. This modern rendering of the ancient image includes the three rivers (the St. Joseph and the St. Mary’s Rivers come together to form the Maumee River) in our city, the Coat of Arms for both the Diocese of Fort Wayne/South and then Bishop John M. D’Arcy along with his motto “His steadfast love endures forever”, and small images of the “Old Church, New Church.” The Greek inscription above Mary is an abbreviation for Mother of God, the original and current name of the parish.